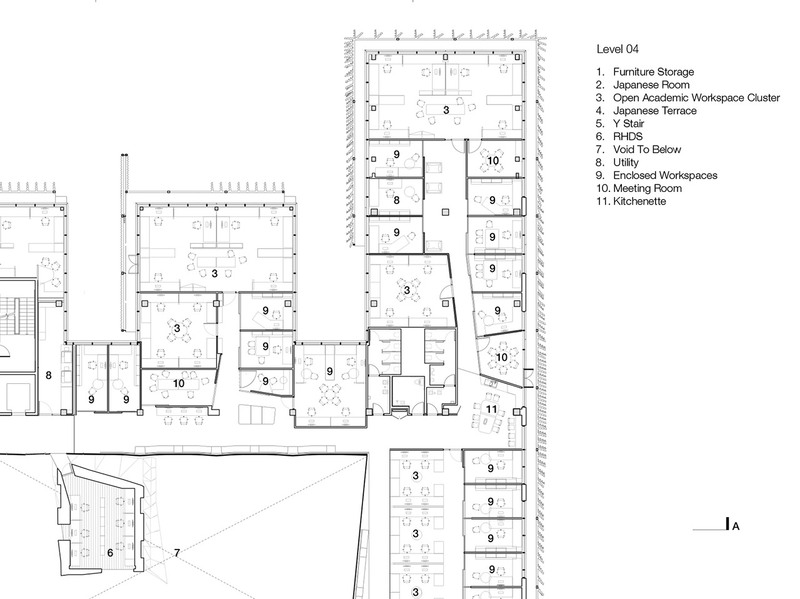 MSD combines two distinct systems of spatial organisation: An open-ended, horizontal concourse at ground level that connects external campus spaces and, on upper levels, studios are arranged around an atrium where a complex network of potential connections are actually visible across a vertical open space. 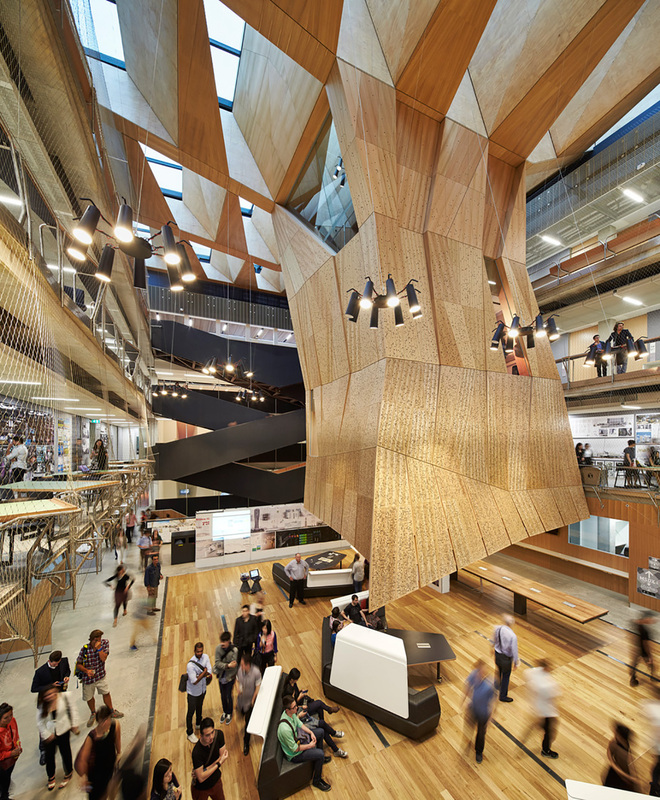 On the atrium floor, students and staff can use three different types of collaborative setting: an intimate space under the suspended timber-clad studios, moveable high-back sofas in the noisier open space, and a long fixed high bench that connects the two. The utilisation rates for each space are yet to be tested. 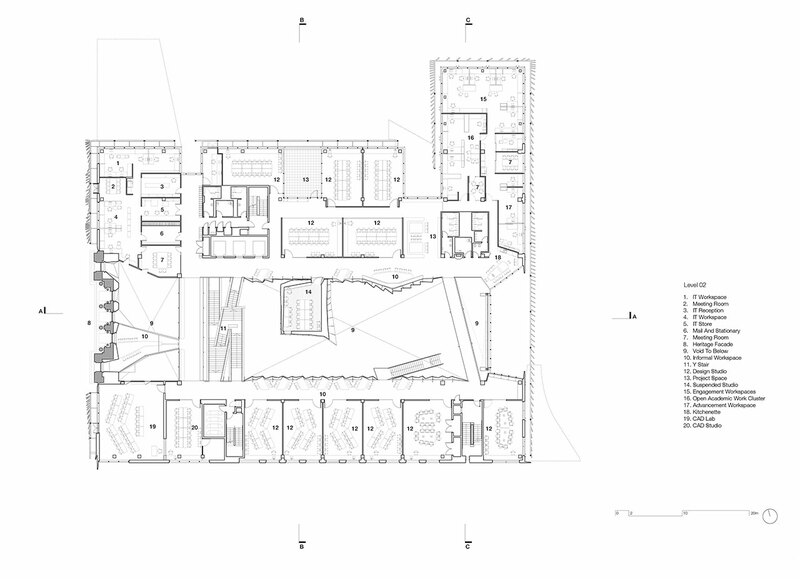 The occupation and use of open, informal areas diminishes the further up and away one gets from the atrium floor. Academics are given the choice to work in private or shared offices. Uptake is around 50/50. 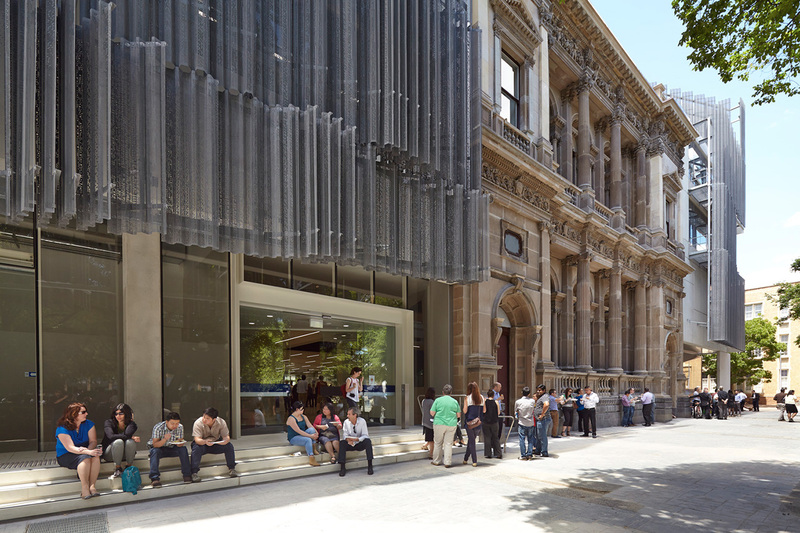 The Melbourne School of Design is the result of an international competition, organized in 2009 by the University of Melbourne. Shortlisted studios included Denton Corker Marshall, Diller Scofidio + Renfro and the ultimate winners: John Wardle Architects and NADAA. The former Dean of MSD, Tom Kvan, believes that the new building has revitalized the core of the campus and enhanced the learning experience of all students, while "invigorating our academic community”. 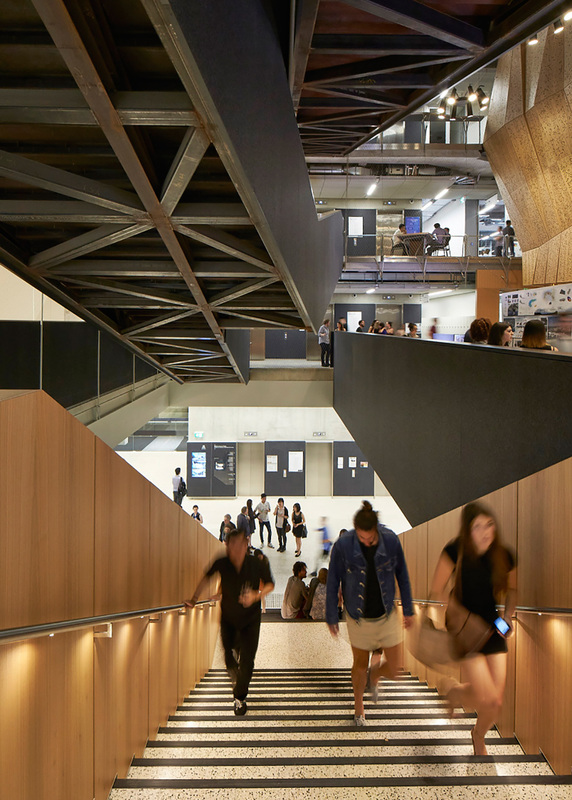 MSD is organised around two distinct design spatial strategies: the ground floor acts as a horizontal continuation of the public realm, open to all as a thoroughfare between other buildings, schools and spaces on the campus. The upper level atrium was conceived as the heart of the school. 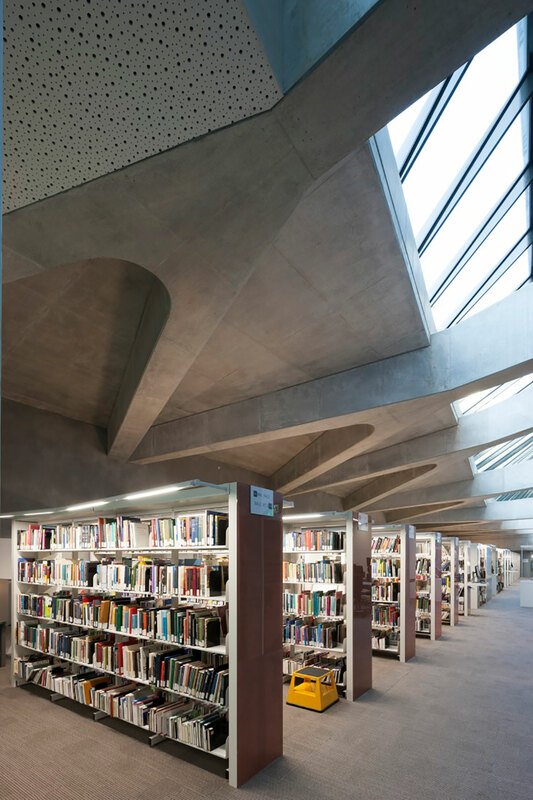 The ground floor concourse relates to the Fabrication Lab and the Library in much the same way as a street does to its retail outlets. The activities in those functionally specific interior spaces are highly visible to passing trade, enticing us to buy what they are selling. 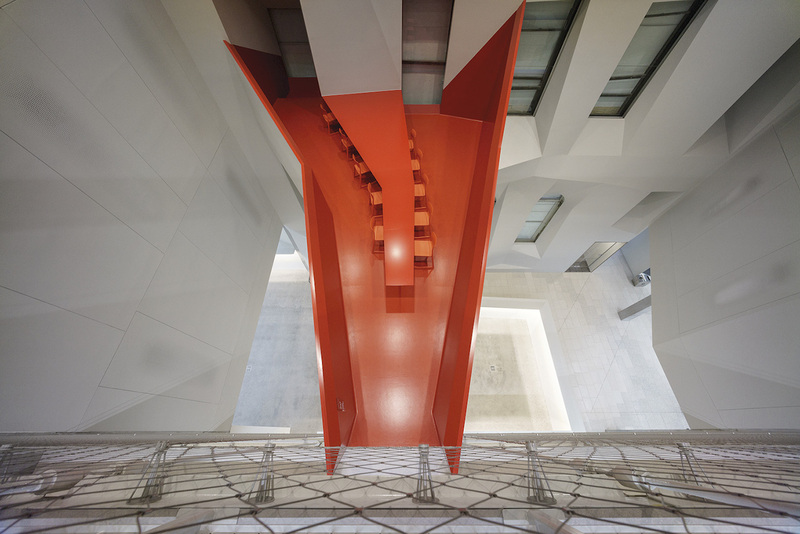 There are some opportunities to sit and wait, but for the most part, the experience is very much about transition, punctuated theatrically by the pause of a generous stairs leading us to the upper level Atrium. The vertical organising space is a destination with a very different story: On any given day, the place is packed with students using a multitude of work surfaces and seating affordances; some working individually, but most working in small groups. Once intended to be open to all faculties, as an unexpected result of its success the space soon became oversubscribed and overcrowded. As a consequence, the experience is now reserved for the staff and students of the school. On the atrium floor, most of the furniture is moveable, to accommodate different sized groups. However, a fixed, high bench provides a backbone of stability; a scaffold where students can work individually, in close proximity to others. The overall experience here is one of oscillating dynamism, producing a palpable sense of energy. 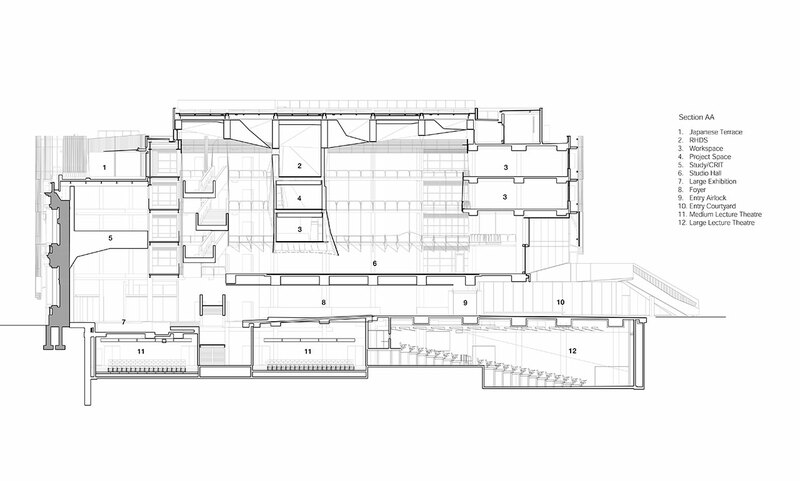 On the upper levels around the atrium, wide balconies host a range of informal settings. 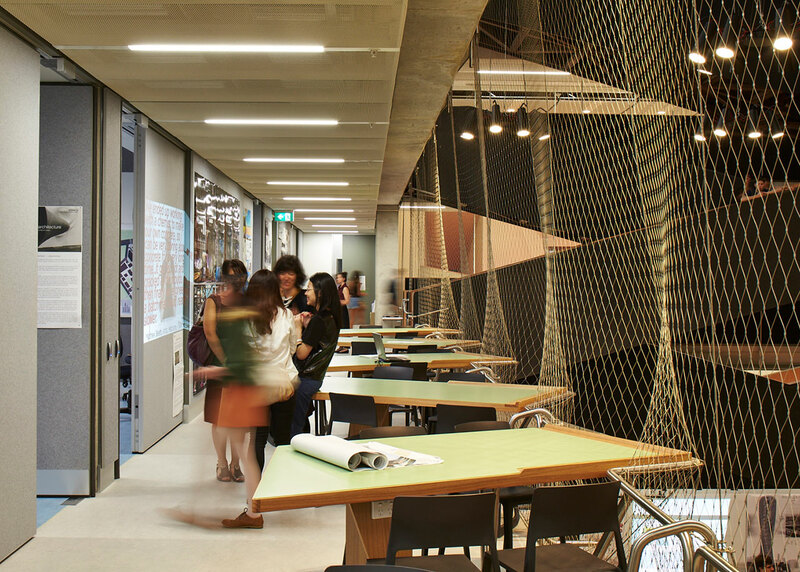 On level 1 and 2, tables and chairs line the netted balconies outside the studios, providing valuable and much utilised breakout spaces for students poised between classes. On the uppermost levels, the settings change to that of long banquettes with small tables, intended for quiet work away from the bustle of the atrium floor. Interestingly, these are the least utilised of all the functional settings, perhaps because of their remote location or because they only support individual activities that can occur anywhere. Such hypotheses may be worth further investigation but one thing is clear, MSD is a place for students to congregate and collaborate, both inside and outside the studio. Some of the bones of the MSD remain visible after completion. Andrew Hutson, Deputy Dean at MSD, points out that the original thinking behind the theme of Built Pedagogy was not that the building would display how it is assembled (that idea came later), but the way it is organised would be transparent; demonstrating how the school wanted teaching and research to happen in an integrated way: "the brief was for teaching spaces to be done in a particular way, where they open on to other spaces: You have a visual connection to different teaching modes: you can see the library, you can see the workshop as you come in. You are aware of the IT areas and seminar teaching areas that open out into the common areas." 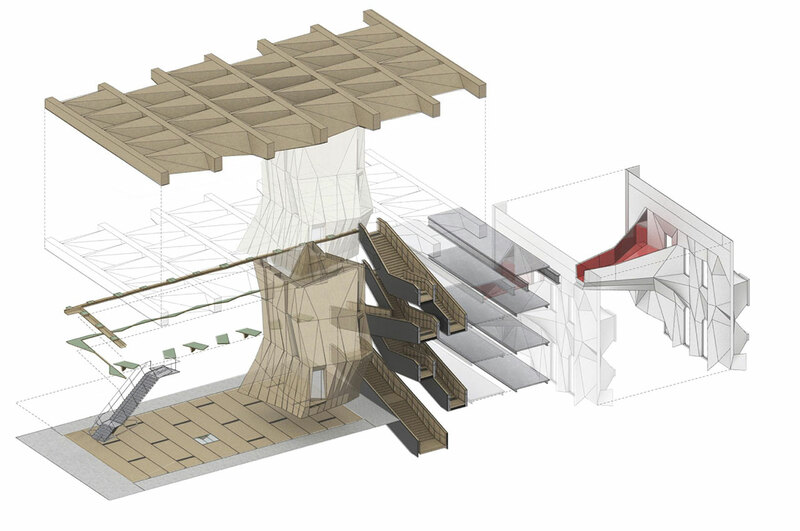 Meaghan Dwyer, a Principal at JWA, confirms that the atrium, and its connected boundary spaces, were part of their primary response to the competition themes; an approach that was strongly supported by the school. 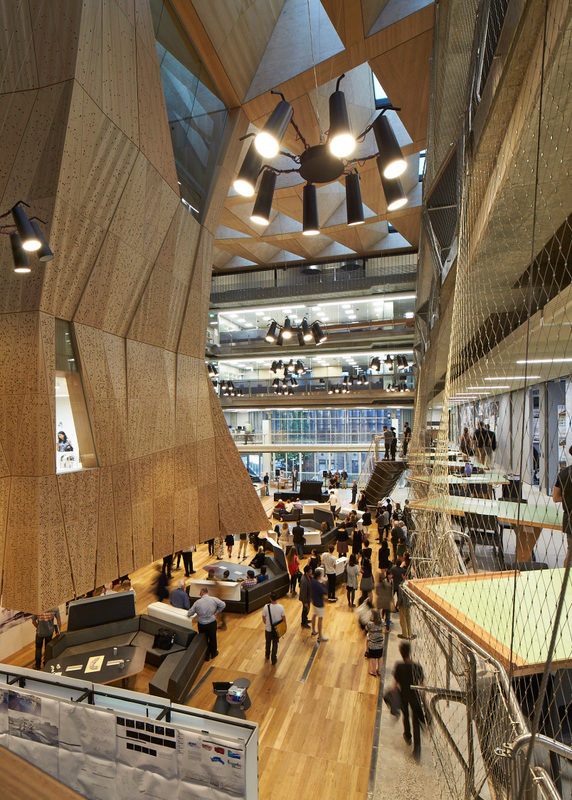 Andrew adds that the atrium was pushed, even though it makes the footprint bigger and adds cost, because it creates an explanation core inside the building: "You can stand in the atrium, look down, point and explain the organisational structure of the building. There are studios there; on this side we’ve got academic staff; over there are the function spaces and so you can see how the movement works and explain everything about the building. It's not just for the benefit of the people visiting, everybody in the building also understands. You can sense the whole thing happening as a system and focus in on very specific elements of it." he explains. 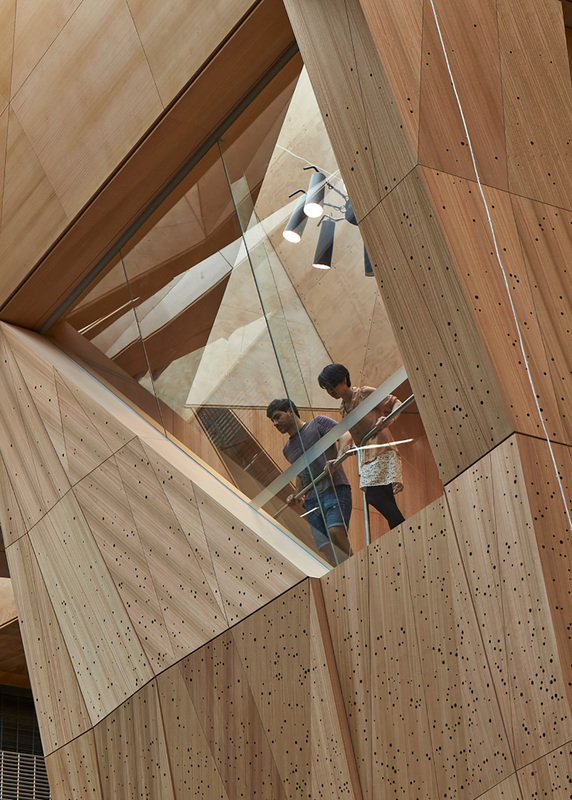 As a building dedicated to the education of architects, the decision to expose architectonic elements, usually hidden from view, was also an extension of the clients brief; one that evolved from a number of co-design workshops about teaching spaces, library, fabrication workshop and ergonomic workspaces. 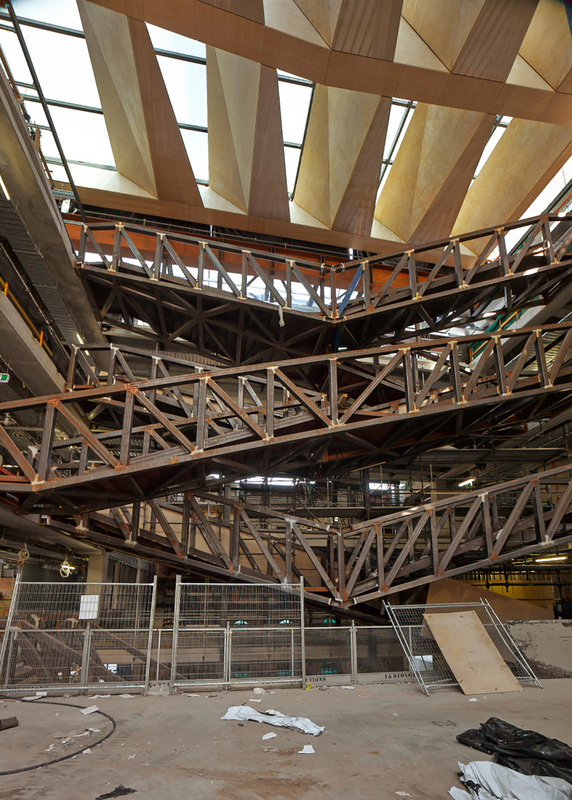 For example, the steel framing used to support the stairs is visible from underneath, as is the prefabricated timber roof structure. 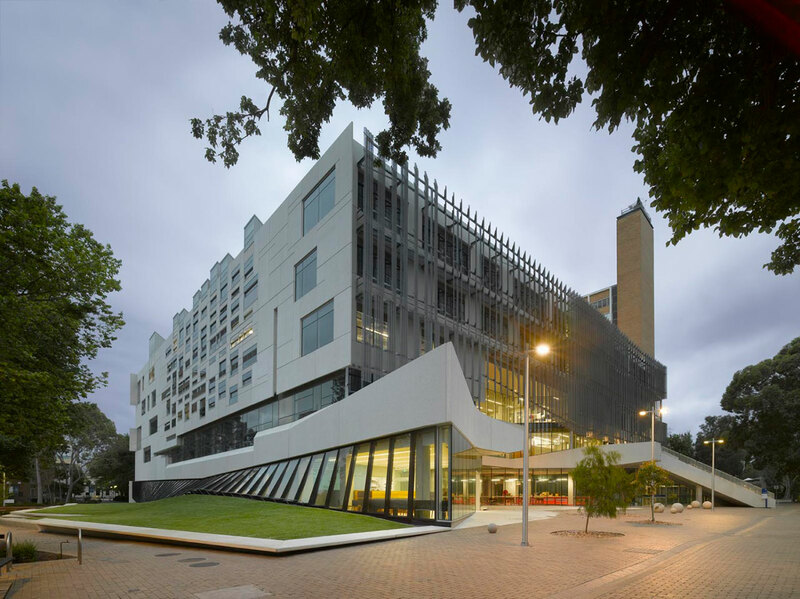 The school itself has become a convenient case study for construction technology studios. 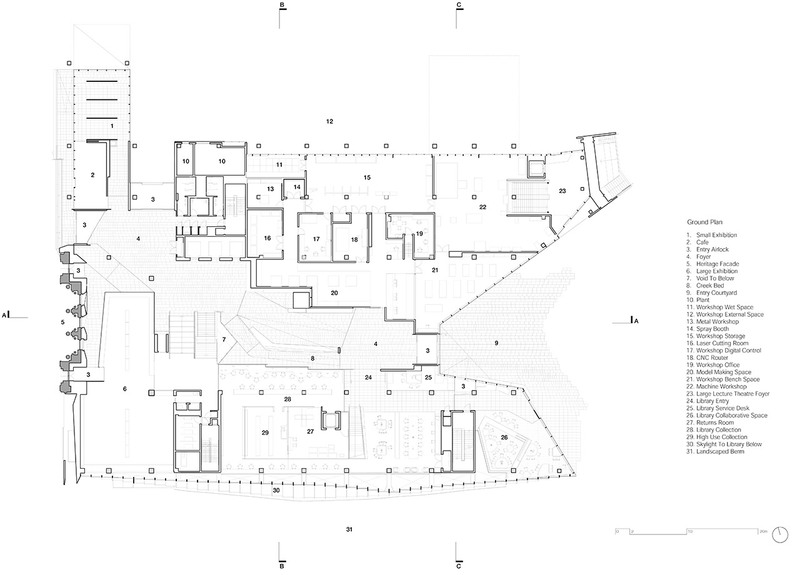 The size of each studio space was also deliberately set for small groups of up to 16 people. Although some tutors struggled to adapt to the new ratios, according to Andrew: "the school strongly believes that the intimacy of smaller spaces encourages dialogue and the problem with large groups is that there is a gradient effect where people at the edges are not engaged." This hypothesis is worth further investigation. Andrew also speaks about the building as a site for integrated research and teaching: "The question was how to make an environment that encourages collaborative research, for complex projects and to attract research funding. On its own, the building is not going to do that. However, it can facilitate or obstruct, depending on the design." His thinking is supported by case study research that indicates over eighty percent of information exchanges, between researchers, occur through unplanned encounters in accessible environments.4 In this instance 'accessible' means those settings at the intersections of circulation paths, between a number of different spaces. At MSD, academic workspaces are provided either as individual offices, or shared rooms for up to six people, and staff were offered the choice. According to Andrew, the shared spaces are currently not used for shared research, with some exceptions, because people drift and a researcher may be working with more than one group. "Academics select the shared spaces because they either want to be in that kind of environment; they are connected in terms of ‘level’; or they share interests but not the same research focus." He explains. Each shared room is subdivided by screens that create a place of focus and connection, by diminishing visual distraction, while allowing light and sound to filter through. Permeable but distinct boundaries are evident. There is a sense that, over four years, each academic has colonised their own niche with the artefacts of their work, subtly exposing others to their ideas while establishing organic connections that would be difficult to consciously construct. Unallocated spaces in threshold territories, between the academic offices and design studios, are occupied on an as-needed basis, by either staff or students, depending on the time of year. Once selected, the design for MSD evolved over a period of an entire year, through an iterative dialogue between the design team and the school, before the involvement of the project management team. According to Andrew, the school believed that a team that worked well together was more important than a selection made on the basis of cost. For this reason, the architects and the school chose the consultants and the main contractor together. 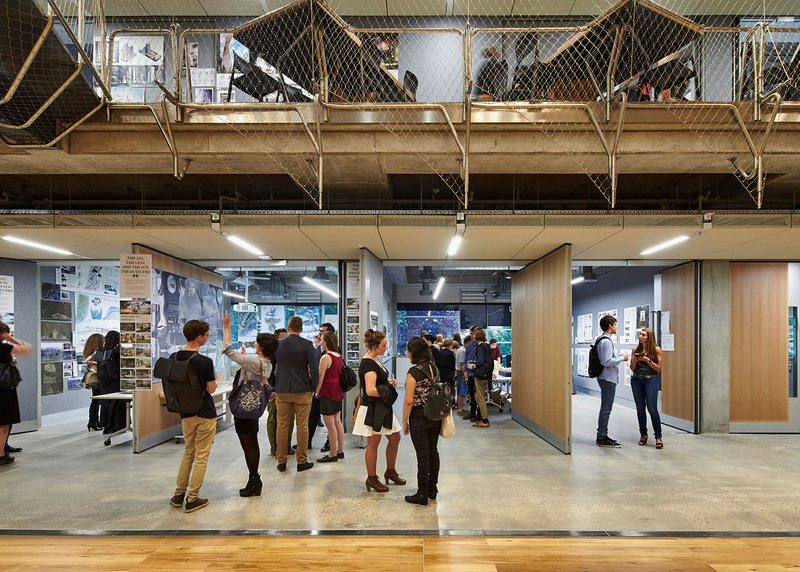 Meaghan strongly agrees: "the Dean and Faculty were instrumental in setting the culture within which we worked - they were very clear that this building needed to be an exemplar of good design for all disciplines. When it came to value management they insisted on a very reasoned approach where all cost savings were considered against the projects themes." The growing role of project managers, in the field of architecture, has become a globally contentious issue, particularly in the light of Jean Nouvel's Philharmonie de Paris. 5 However, in the case of MSD, both Meaghan and Andrew are very positive about the role of the project manager, Pippa Stockfeld, and the contactor, Multiplex, in the value management process: "Contrary to other previous experiences, we found they were able to save cost by introducing innovation, and cutting construction time, rather than cutting scope or quality. The prefabrication of the atrium roof elements in particular allowed them to save as much as 3 or 4 months, which in turn allowed then to reduce their site costs." 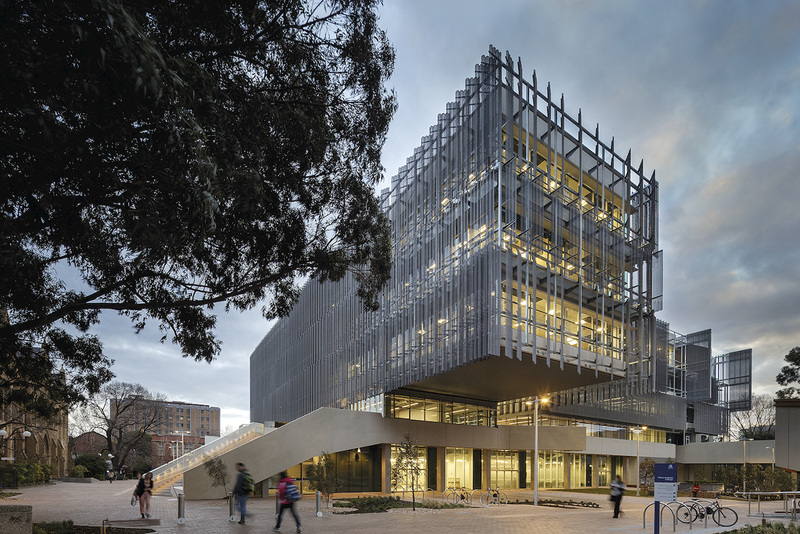 The school's emphasis on a collaborative culture for the project, where design quality took precedence over project hierarchy, appears to have played a significant role in the successful delivery of the final design. The school continues to grow and the use of space continues to evolve. For the most part, the hypotheses generated during that rare year of briefing and design have proven correct. In an iterative world, MSD now provides a tempting target for future detailed research into the relationship between collaborative activity and spatial organisation, where the void is the device by which we can create and perceive a complex network of relationships. Ideas are not forced, they brush off on us through constant exposure, over time. Toker & Gray (2008) reported in Lansdale et al, (2011). Designing for interaction in research environments: A case study. Journal of Environmental Psychology 31 pp 407-420.